Over the past few years, whenever I asked the boy if he would like to have a party for his birthday, he would say no. This year, however, when I asked if he wanted a party, he happily agreed and wanted to have a Superheros theme birthday! And so, this excited mummy went into overdrive mode to try and plan for the best possible first birthday party! 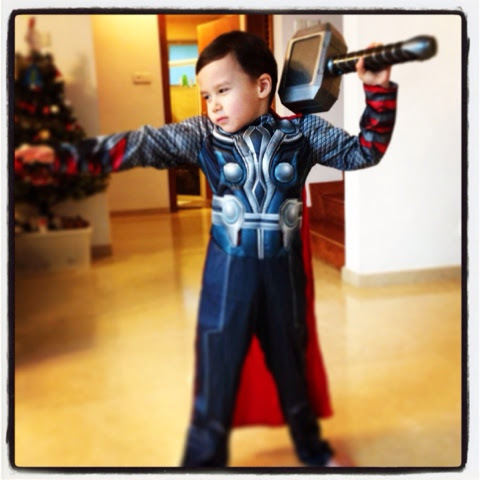 Of late, he had been totally into the Avengers and loved his costumes. He wanted all his friends to come in their favorite superhero character. 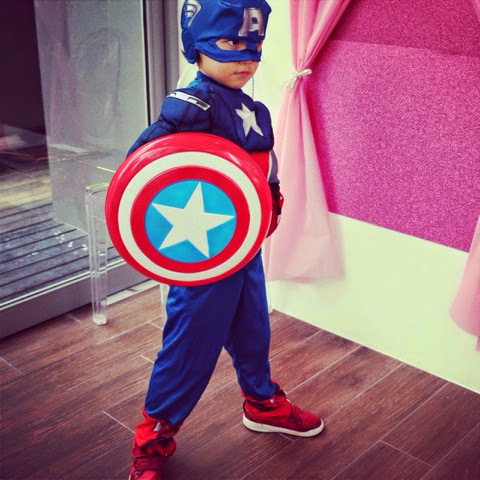 This is the boy in two of his favorite Avengers characters! I started with researching the internet and found many ideas for such themed parties. They gave me a lot of inspirations. The first thing I wanted to settle was the cake. 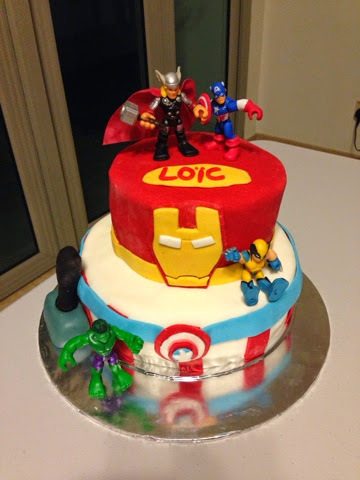 After going through many pictures of superhero cakes, gauging my own cake-making skills and the time I have to physically make the cake, I improvised and came up with a two tier Captain America and Iron Man cake with some Avengers characters as toppers. As I was working and did not have much time to make the cake from scratch, I bought organic cake mix and baked the cakes three days before the event and refrigerated them. The top tier was vanilla and the bottom chocolate. Two days before the party, I made my own vanilla buttercream (with reduced sugar, replacing 1/3 of the sugar with corn flour) for the vanilla cake and dark chocolate ganache for the bottom tier and creamed the cakes before refrigerating it to set them for decorating the next evening. I made sure I found the figurines of his favorite Avengers, Thor and Captain America a few days before the eve of the party. That night, I started around 9pm after the kids are in bed and only completed the cake at 4am! I used the little character toys, which I bought from Isetan, as toppers and decorations. I also made a small Thor's Hammer using fondant for the cake. 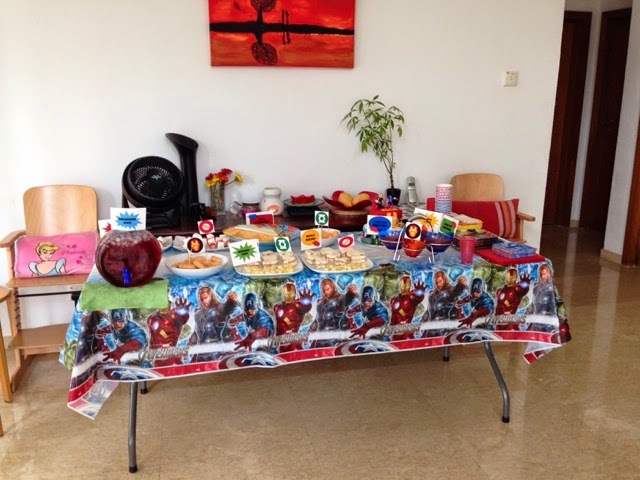 For party decorations, I bought some Avengers banners and printed some fun food names such as "Muscles Builder", "Superhero Juice" and "Laser Eyes Enhancers". We had sandwiches, carrot sticks, cucumber sticks, strawberry and marshmallow sticks, mini sausages, cheese cubes and some nachos. 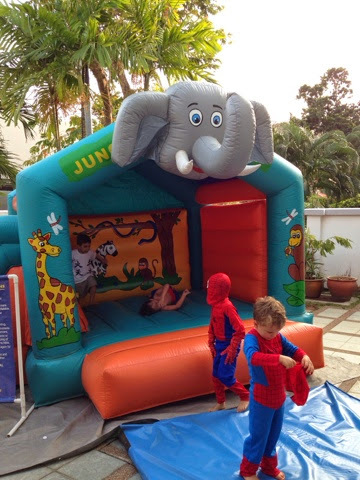 We also planned some games for the 10 little boys and had a small bouncy castle to entertain them. We did not manage to play most of the games as the boys were quite active running all around. I will have to remind myself that most boys are not as patient as little girls to wait for everyone to gather and listen to instructions. Batman, Spider-Man, Superman, Ironman, Thor and others came to the party and after the three hour party, the Super Mama was exhausted. The Superheros enjoyed themselves, ate healthy snacks and devour the cake. Most importantly, the boy really enjoyed himself! It looks like this is the start of more birthday parties to come! Happy 5th Birthday my darling son! You will always be my Superhero! You can make your daughter princess. Disney princesses are one of the most popular birthday party themes for kids. Dressing up in costumes, acting out the stories, and playing princess games are all part of the fun. How can you make the day even better for your princess? Rent an inflatable moonwalk to fit the theme! This is perfect! I have to share this post with my husband because we are planning to book one of the NYC venues for our son’s birthday party. Here, the costumes are perfect and the kids look so adorable. I am going to save this post because I liked everything about it.